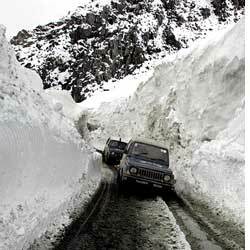 the Srinagar-Leh highway opened 45 days ahead of schedule--on April 15. While the Jammu and Kashmir government patted its own back for achieving the "record feat" of opening the 434 km highway that remains closed for six months a year, April 17 proved to be the party pooper. It snowed and the highway was shut again. The state claims it has improved equipment to clear the snow off the road but experts see trouble and diagnose it as global warming. Also, a global report says that the month of March in 2008 has been the warmest March ever. "The temperature at this time of the year in the 1960s used to be -60c but now the temperature is not more than -40c to -45c. The temperature is increasing everyday and the snow melts very fast. Add to this better machinery for snow removal, which helped us open the highway earlier this year," said colonel Lopzang Neema of the Border Roads Organization (bro). The bro is responsible for clearing the highway of snow every year. About 20 years ago, it was difficult to open the highway before June-end. It was opened on May 1 last year. S K Dash of the Centre for Atmospheric Sciences, iit Delhi, advises caution. "If the surface temperature is increasing and the snow is melting fast, it is definitely an indication of warming," he said. Also, less snow formation in winters indicates an easy clean-up, he added. Krishna Kumar of the Indian Institute of Tropical Methodology, Pune, agrees. "Technological upgradation may be a crucial factor in removing the snow, but the temperature has certainly increased over the years," he said. Washington-based National Oceanic and Atmospheric Administration's 2008 report said it was the warmest March on land ever. And therefore, even though Asia had its greatest January snow cover this year, the warm conditions in March led to rapid snow melt and thus the March snow cover on the continent was a record low. The report also said that land and sea temperatures, however, were nect to the highest this year; 2000 experienced the highest land and sea temperatures.